Close up of the InstaStep bracket. 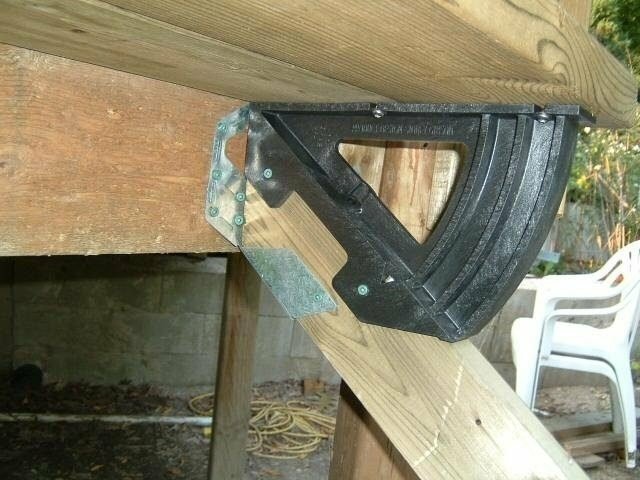 I recently received an email from a visitor to this site asking me where I had bought the Insta-Step brackets that I used for my deck stairs back in 2005. He was unable to find them anywhere. I had bought the brackets at Home Depot. However a search of the US and Canadian sites earlier this week turned up nothing except for the Dek Mate bench brackets. No stair brackets to be found. So I dug deeper. Eventually I was led to a couple of company websites that seem to tell the tale. The Dek Mate line seems to be part of 2×4 Basics. Blitz USA acquired 2×4 Basics in 2009. Blitz USA is part of Hopkins Manufacturing. I have been unable to learn when the Insta-Step stair bracket was discontinued. It is clearly no longer part of the product portfolio. Was it a victim of the recession? Or was it a failure before the recession even hit? When exactly did the manufacture of this product cease and why? For what it is worth, I thought the Insta-Step bracket was expensive at the time that I used it. But for me, the ease of installation justified that expense. These brackets have been in place on our deck for close to seven years now. I would absolutely recommend them to anyone and I would definitely use them again myself. It is very unfortunate that this product is no longer available. Update: On May 31, 2012 I received an email from F3 Brands (which now carries the DekMate bench bracket)–part of the Hopkins Manufacturing group– in response to my inquiry about the step bracket. The email simply stated that they no longer have the rights to sell it. The email did not offer any further details. The question now is who, if anybody, owns the rights to this product and are there any plans to bring it back to market? Update #2: August 22, 2014: All world-wide rights to this product including patent rights, trademark, and domain name are for sale by the current owner, Sidney Gibson Limited. The website, instastep.com was last updated in September of 2008. It was apparently offline when I was searching for information on this product in 2012. Update#3: 2018: The status of the Insta-Step remains unchanged from the last update. The run and the minimum rise would be determined by the size of the bracket. The space between the brackets could be adjusted to increase the rise if necessary. However, these brackets are no longer available. The world-wide manufacturing and intellectual property rights have been for sale since 2008.